A-HOTEL.com - Luxury and cheap accommodation in Pushkino, Russia. Prices and hotel, apartment booking in Pushkino and surrounding. This indicative offer was derived from the most recently booked accommodation in Pushkino and sort by the price, from cheapest Pushkino accommodation to the most expensive hotels. To select accommodation by your preferences we recommend to choose from 2 accommodation offers in Pushkino in total. By entering the dates of your overnight stay in Pushkino and using the filter tools you can sort the best possible accommodation for you. The entered dates of your stay are crucial for the most accurate offer as it derives all the online information on pricing and availability of Pushkino accommodation. 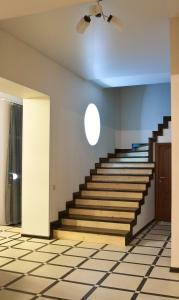 Then you can book the selected Pushkino lodging (hotels, apartments etc.) immediately. Situated in Pushkino, Rai provides a bar. Among the facilities of this property are a restaurant, a 24-hour front desk and room service, along with free WiFi. Located in Bronnitsy, Gostinitsa Marusya has barbecue facilities. Boasting a 24-hour front desk, this property also provides guests with a terrace. Hotel Diamant Borsheva has a terrace, shared lounge and bar in Bronnitsy. All rooms boast a flat-screen TV with cable channels and a private bathroom. Diamant Village is situated among a quiet pine tree forest in Denezhnikovo. You will find standard room or cottage rentals at this property. FDiamant is located in a quiet area near a forest in Denezhnikovo, a 20-minute drive from Domodedovo International Airport. It offers comfortable rooms with free WiFi. Гостевой дом с бильярдом offers accommodation in Ganusovo. All rooms include a flat-screen TV. Located in Stanovoye, Country House in Stanovoye offers accommodation with a private pool and garden views. The air-conditioned accommodation is 46 km from Moscow. Dom Vishnya is situated in Domodedovo. Featuring free shuttle service, this property also provides guests with a children's playground. Located in Sin'kovo, Country Club Villa MUSE offers accommodation with free WiFi and flat-screen TV, as well as a fitness centre and barbecue facilities. Units include a fully equipped kitchen with a dishwasher, oven, coffee machine and kettle. Featuring a garden, Загородный коттедж с сауной Околица features accommodation in Kuznetsovo with free WiFi and garden views. The accommodation is 49 km from Zheleznodorozhnyy. Offering free WiFi and garden views, Country house Banya Okolitsa is an accommodation situated in Kuznetsovo. Guests benefit from a terrace and a barbecue. Guest House Skazka is located in Ivanovka and features a private pool, a kitchen and lake views. The property was built in 2015, and has air-conditioned accommodation with a terrace and free WiFi. 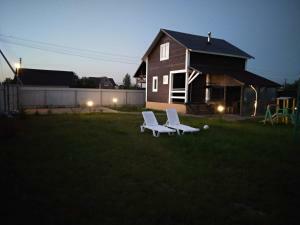 Situated in Domodedovo, Guest House in Motyakino 50 has a garden, a terrace and a shared lounge. The accommodation offers karaoke and free shuttle service. Boasting free bikes and a restaurant, Hotel Aristokrat is situated in Beloozërskiy. Featuring a 24-hour front desk, this property also provides guests with a terrace. Situated in Ul'yanino, Motel 72 features air-conditioned rooms with free WiFi. The property offers a 24-hour front desk. Set in Beloozërskiy, Mini-hotel Akvamarin provides air-conditioned rooms with free WiFi. The hotel features a spa experience, with its sauna, fitness centre and hammam. Situated in Pletenikha, Village by DPH offers air-conditioned rooms with free WiFi. All rooms feature a flat-screen TV with satellite channels and a private bathroom. 2.2 km from Ramenskoye Bus Station, Hotel Usad'ba is located in Ramenskoye and provides free WiFi and express check-in and check-out. 1.8 km from Ramenskoye Bus Station, Wesendorf Hotel in Ramenskoye is situated in Ramenskoye and features a shared lounge and a bar.